Here we have selected the best cycling events from around the world. These are events that are cycling challenges, but also include festival fun. The landlocked, mountainous Buddhist kingdom of Bhutan is best know as a beautiful trekking destination with monasteries, fortresses and 7,000m high mountains. Tour of the Dragon has a reputation for the toughest one-day mountain bike race in the world. Starting at 2am in central Bhutan’s Bumthang, the route travels 268km over four mountain passes to western Bhutan’s Thimphu. Starting at an altitude of 2,700m and finishing at 3,340m, with a total altitude gain of 3,790m through its challenging but incredible route, this event is guaranteed to help you not just see Bhutan’s breath-taking scenery but feel it. There is also a less challenging 60km route. With retro bikes and gear, all manufactured any time before 1987, plus dressing up, novelty facial hair, camping, French châteaux and two-thousand riders, this festival has a party atmosphere. The cycling events include a 30km route along the Loire valley and a challenging 130km Authentic 1868 route along gravel roads through the beautiful Saumur region. Pronounced ‘Golden Two Four’, this inaugural of cycling events will see just 500 lucky riders try to ride as many of the 14km laps as possible through some of the best managed woodland trails within a 24 hour period, with about 500m of vertical ascent in each lap, including some technical blue trails. Riders will race in relay teams of two to 10, though there is also a solo category. Canada is promising a busy events village plus a festival feel all weekend to keep everyone entertained. Another of the UK’s best cycling events, 1700 endurance mountain bikers get a chance to ride in the usually private woods of Princess Anne’s Gatcombe Park estate in Gloucestershire, UK. There is a real festival atmosphere throughout the weekend, with the course also running through the campsite, where thousands of supporters can watch the steady stream of riders’ all night long. The 8 mile course is challenging but fun, with steep climbs and descents, and some singletrack. The island of Skye in Scotland’s Inner Hebrides has dramatic mountain scenery. Both 78km and 151km route options start and finish in the east coast town of Portree, before exploring the island to the north. Scotland’s best cycling events will see you pass the Old Man of Storr, ride around the stunning Trotternish Peninsula before returning on the west coast with the Atlantic Ocean beside you and the Cullin mountains ahead. The largest of the UK’s multi-day cycling events sees two-thousand road cyclists ride an 185-mile loop of the nation’s capital. Linking the Downs in Sussex with the city of London, via Tower Bridge over the River Thames, the event provides regular stops en route, chaperones and medical support. It is an inclusive event with a community feel, catering for every level of rider. Advertised as ‘professional events for amateurs’ the Alpine Challenge gives you the closest possible experience of riding like a pro. Following a timed Prologue that will split the 200 riders into groups of differing ability, there are three days of spectacular cycling in the three mountain stages including famous climbs such as the Col de Colombière, Col de Leschaux, Cos des Saisies and the Col de la Forclaz. Another of our best cycling events from British Columbia, this road race finishes in the world-famous mountain resort of Whistler. There are several distance options, from the beginner-friendly 55km Medio route which has 700m of vertical ascent, to the main 122km Granfondo route, with its 1700m climb. There is a Forte option, which adds 30km and almost 800m of ascent with a detour to the top of Cypress on the way for those who want a challenge. Although everyone gets a time, for this one day of the year the roads are closed, so that all eight-thousand riders can enjoy the incredible views at their leisure. 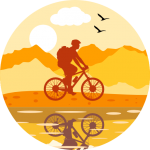 Probably the world’s best cycling events if you consider the number of applicants, this multi-day mountain bike endurance cycling race is 8 days and covers 740km. Just 1,200 cyclists are invited via lottery, who then cycle almost 2,000m a day in pairs through the Cape’s fantastic scenery. Pros and specialists who have been invited to race are at the front of the field, while the remainder enjoy eight days of truly epic trail cycling.